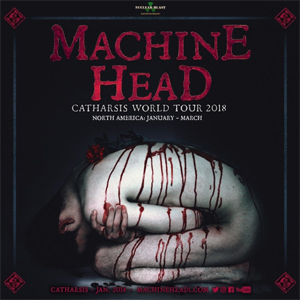 Bay Area metal titans MACHINE HEAD will release their new album Catharsis on January 26 via Nuclear Blast Entertainment. The CD/DVD Digipak edition of Catharsis contains a full, 21-song live concert filmed at The Regency Ballroom in San Francisco in 2015. Today, the band has released the live video for the song "Now We Die", which originally appeared on 2014's Bloodstone & Diamonds. Watch the live version of "Now We Die" on KNAC.COM HERE. Catharsis was produced by MACHINE HEAD's Robb Flynn and recorded, mixed, and co-produced by Zack Ohren (FALLUJAH, ALL SHALL PERISH) at Sharkbite Studios in Oakland, CA. Mastering was handled by Ted Jensen (HATEBREED, ALICE IN CHAINS, DEFTONES) at Sterling Sound, New York, NY. Cover photography was created by Seanen Middleton. "The Blood, The Sweat, The Tears"
"Descend The Shades Of Night"